Beautifully renovated cosy and peaceful 3 bedroom cottage. Also available for weddings and functions by application. 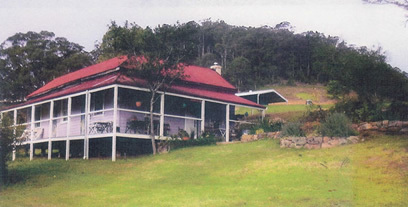 Typical Historic Miners Heritage Cottage,c 1901 with all modern facilities. Exclusive getaway and retreat for couples or groups. Fresh air, beautiful surrounds and nature at your fingertips. Genuine relaxing country break on a small Dexter cattle property at Kulnura. Leave the city behind you and come stay with us. You can achieve some soul restoration in the peaceful valley. Beautiful self contained house (sleeps 12). Perfect for 1, 2 or 3 families. With farm animals at your door. Set on 50 acres. Award winning gardens with ocean views. Marriage Celebrant, Namings, Commitments, Re-affirmations. Provide trail rides, agistment, as well as lessons, clinics, kids camps and activities. Bookings for baptisms, weddings and funerals. For all bookings phone Di or Paul. For all bookings phone Annette. The local community is currently lobbying for the school and it's grounds to become a resource for the area. We can help you tailor your stay with us to be as active or as relaxing as you want. A ceremony performed by a professional. Specialising in sandstone constructions for both small and large projects. Custom design, renovation, extension, bathroom & full build. Landscape design/construction inc plant sourcing & selection. All your painting and decorating needs. Obligation-free quotes. Licence No 71725C. Call David. Walkabout Dogs - In home animal minding and dog walking. Available for weddings, birthdays, functions. See Valley Ventures for meeting time and venue. Volunteer assistance, new members always welcome. Supporting your community whilst learning new skills.